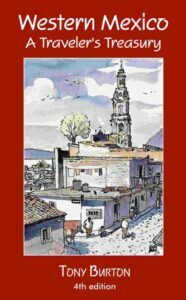 Sombrero Book is pleased to announce that the 4th (2013) edition of “Western Mexico: A Traveler’s Treasury” is now available (Kindle and Kobo editions). In “Western Mexico: A Traveler’s Treasury”, author Tony Burton reveals the magic of Western Mexico. Relaxed and intimate, this easy-to-read yet authoritative account features 37 original drawings by Canadian artist Mark Eager and 10 maps. Enjoy the author’s unique insights into local history, ecology and traditions. Now in its fourth edition, the book remains a favorite among knowledgeable travelers visiting this region of Mexico. This new edition is one-third larger and includes dozens of new places worth exploring. It incorporates several new chapters, including four (in part five) devoted to the region around Zacatecas. Every chapter has new material. Maps have been redrawn and travel directions updated. A mixture of interests is represented. Included are historical sights such as Zacatecas, Lagos de Moreno and San Blas; artistic colonies like Ajijic; and lakeside communities, including Chapala and Pátzcuaro. Alongside them are ecological wonders, such as Manantlán and the monarch butterflies; old mining towns like Angangueo and Bolaños; coastal resorts such as Barra de Navidad and Puerto Vallarta; Indian villages like Angahuan, and a host of others. Many of these smaller places in Western Mexico offer a glimpse of the Mexico behind the mask; they are places where Mexico has retained her ancient culture and her ancient traditions. All the destinations in parts one and two are within day-trip range (maximum three hours driving time) from Guadalajara (Mexico’s second city) or nearby Lake Chapala, a popular retirement center for Americans and Canadians. In part three, all the locations described are worth at least an overnight stay, though Tapalpa, Mazamitla and Tamazula are still within three hours driving time of Guadalajara-Chapala. Parts four to nine describe longer, three or four day trips, which are all well worth the investment of extra time. No fewer than 17 of the towns featured in the book have received the federal designation of “Pueblo Mágico” (Magic Town), in recognition of their cultural, historical or ecological significance, and facilities for visitors. There are now many excellent boutique hotels, some of them in quite unexpected places, making it far easier to explore the less traveled areas of Western Mexico. Whether your interests lie in art, architecture and archaeology; fiestas and folklore; unusual sights and natural wonders, or in Indian villages and indigenous handicrafts, this book will help you discover for yourself Western Mexico’s many hidden treasures. Author: Tony Burton has specialized in exploring and writing about Mexico for more than thirty years. He is the author of “Lake Chapala through the Ages: an anthology of travellers’ tales” (2008) and co-author of “Geo-Mexico, the geography and dynamics of modern Mexico” (2010), and a three-time winner of ARETUR’s annual international travel-writing competition for articles about Mexico. For other formats besides Kindle and Kobo, please use the “contact us” form and we will do our best to meet your particular needs. In the twenty years since its first publication, “Western Mexico: A Traveler’s Treasury” has become a classic. The latest edition is easily the best ever! Award-winning travel writer Tony Burton reveals the magic of Western Mexico. Relaxed and intimate, this easy-to-read yet authoritative account features more than 35 original drawings by Canadian artist Mark Eager and 10 maps. Enjoy the author’s unique insights into local history, ecology and traditions. Now in its fourth edition, the book remains a favorite among knowledgeable travelers visiting this region of Mexico. The 4th edition is one-third larger than the previous editions, and includes dozens of new places worth exploring. It incorporates several new chapters, including four devoted to the region around Zacatecas. Every chapter has new material. Maps have been redrawn and travel directions updated. A mixture of interests is represented. Included are historical sights such as Zacatecas, Lagos de Moreno and San Blas; artistic colonies like Ajijic; and lakeside communities, including Chapala and Pátzcuaro. Alongside them are ecological wonders, such as Manantlán and the monarch butterflies; old mining towns like Angangueo and Bolaños; coastal resorts such as Barra de Navidad and Puerto Vallarta; Indian villages like Angahuan, and a host of others.